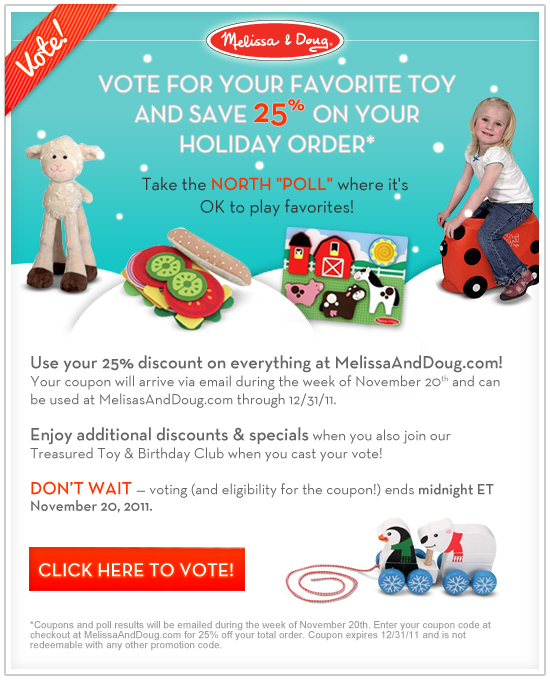 Get a Melissa & Doug 25% Off Coupon When You Take the North "Poll" | A Savings WOW! *$25 coupon is good for $25 off any purchase of $25.01 or more at MelissaAndDoug.com through 12/31/11. Coupon cannot be applied to shipping charges or sales tax. This coupon is specifically for you and can be used only once. It is not redeemable or valid with any other promo code. Disclosure: Melissa & Doug is providing us with a $25 credit for sharing this information with our readers. Please see our disclosure policy for more information.